The latest Black Country Transformational GOLD programme has been completed, giving grants to support 130 Black Country businesses. The scheme aimed to make a positive economic impact in the Black Country by boosting the competitiveness of SMEs in advanced manufacturing, business services, building technologies, environmental technologies and transport technologies. It offered successful applicants access to grants of between £1,500 and £50,000 to support their growth plans. BCT GOLD was administered by Wolverhampton City Council, with Dudley Council, Sandwell Council, Walsall Council and the City of Wolverhampton as acting partners, and additional funding from the European Regional Development Fund. Thanks to 130 businesses successfully going through BCT GOLD, 153 full time (or equivalent) jobs have been created in the region and eighteen new products or services have been brought to market. Projects realised for businesses as a result of the funding include improved digital technology (such as apps, digital event management, online payment facilities and websites) and the purchase of new equipment. 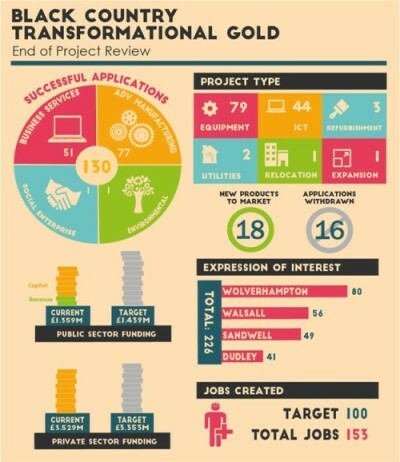 Thirty-two businesses in Sandwell benefited from this round of BCT GOLD. Tracey explained how the grant provided funds for a new computer server and back-up systems. It also allowed Howells to purchase a new racking system, allowing for better stock management, and new and improved extraction systems for the company’s circular saws. “This was in line with our commitment to health and safety, and better working practices”, she said. Sandwell manufacturing company Keight’s Precision Tooling also benefited from BCT GOLD. Director Nicholas Keight told us how the funding – applied for with support from Sandwell Council – enabled Keight’s to buy an electrical discharging machine.